The above image illustrates the problem that has been fixed. This leg will now be correctly labelled as an ascent leg, with proper runtime and gas quantity. BUG FIX: Fixed a bug in the Dive Planner where under some circumstances an ascent leg would incorrectly labeled as a descent leg and given zero time duration. This would lead to incorrect gas usage calculations for this leg, as well as the run time being short by the time it would take for this ascent leg. 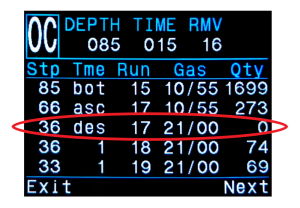 Note that this affected the dive planner, and not the real-time decompression calculations. This fix is the only change for version 28. “Send data failed CRC check” come up on desktop screen?? Hi Wayne, the best thing to do is contact us at our info@shearwater.com address with your problem. Mark will be able to advise and assist you. Hi from Athens and Merry Christmas…. unistalled the shearwater desktop many times with the same result. Question :do I have to install the V27 before the installation of the V28 ? No, you can go directly to V28. We need a transmitter for Open Circuit diving.Several people in our dive club won’t buy a Petrel because there is no transmitter. I appreciate it would be no good for CCR diving. However I feel it is a MUST for both Tec and Rec Open Circuit Diving. Am having the same issue, what was the outcome and how resolve this matter as the new desktop does not allow me to upgrade my Petrel 1 to V28. Although my Petrel 2 is now V29. I have 2 computers one with the old version of desktop 2.3.8, but I cannot find the file from Shearwater to download (zip) and extract file. Please contact us with your problem at our info@shearwater.com email address. We will direct your email to our tech support guru for assistance.